The tips I will be sharing are all based on my experience and I can tell you that despite everyone’s best efforts, there will arise, uncontrollable situations for which you have to put your trust in Allah and be patient. Hajj is an indescribable experience that is supposed to be a challenging. I just wish I was a little bit more prepared for my parent’s sake. 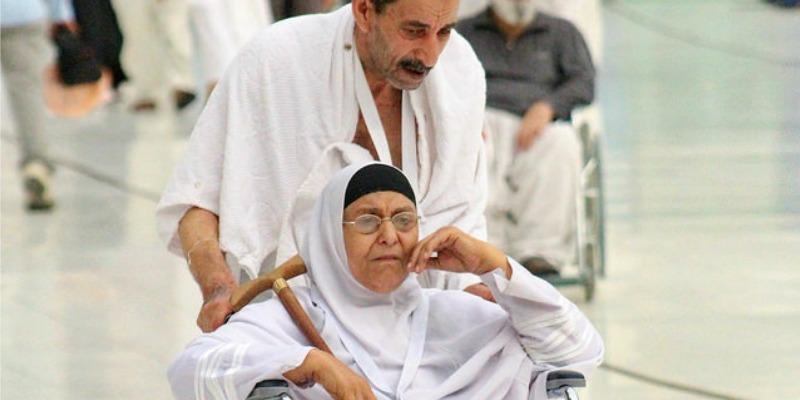 So if you’re going to perform hajj with elderly parents, aunts, uncles, grandparents or whoever else, here a few tips you might want to consider to make things go a bit smoother inshaAllah. Lack of Physical strength: This is an obvious one, but due to their lack of physical strength, you are relied on for everything and their ‘burdens now becomes yours’. Remember this adds to your reward, so try to be patient. Lack of Patience: The one thing I knew when going to hajj was that I had to be patient. What I did not prepare for was helping my parents with that and reminding them to be patient. If a situation arises, step in and be the voice of reasoning. The extreme heat affects everyone not just the elderly; it can cause confusion, dehydration and tiredness. Choose times when the sun is not at it’s hottest to go out. For example, avoid being out at dhuhr time, if possible. The crowds can really test you subhan Allaah. One minute, you are standing next to each other and the next minute you are swept away by the crowd thus losing whoever you were with. Always allow large groups that are holding hands or each other’s garments by moving out of their way, if possible. Then there is always the language barrier. If you get lost, chances are everyone will try help you. The only problem is that, chances are, you won’t understand them, and anyways, there is no official tracking system for anyone to be of any real help. In any case, try your best to stay calm, and don’t panic. Always keep important details written down and go to the police, if you do get lost. Toilets: The long queues for the toilets are unbearable, especially in Arafat. If your elderly parents need to use the rest rooms, always give them plenty of time to queue up (15-30 minutes before ensures that you will be able to use it on time inshaAllah). When packing always remember to pack light, especially for the 5 days of hajj. This means you should probably leave that dslr camera and your stack of hajj books. Study the hajj rituals before leaving for the pilgrimage. Write some the rituals in a small notebook along with all your dua’s. Keep your husn-Muslim (Fortress of the Muslim) and mushaf pocket size, so they can fit into a small bag or pouch. 1. There are many ways to keep all your belongings as light and compact as possible. A runner fanny pouch like this one (link), is a great choice to buy for your parents, grandparents or whoever else you are going with. Always have a little cash handy as well as important medical information, hotel address and phone numbers in their pouch (just in case they get lost). 2. Carry a bag yourself, and be sure to pack some of your important belongings such as high protein snacks and maybe even an flash light (for Muzdalifah). Also keep a plastic bag in there for your shoes when going to the Haram inshaa Allah. 4. This one may sound a little strange (especially if this is your first hajj) but save yourself the heart ache and take advantage of tracking devices, especially if one of the elders you are going with is known to just walk off (like my dad lol). Giving them a GPS tracker like this one (link) can really help keep you sane, knowing that you can just track them. You can also leave a GPS tracker inside your tent, so you can easily find your way back. Because the GPS trackers work with smartphones only, it does mean you will have to also get an external battery pack (link) just in case. 5. Women can generally wear whatever they like, so let’s talk fabrics 😉 . Stay away from synthetic fabrics like polyester or viscose/rayon and stick to natural fabrics like cotton that is not only breathable but is also better at soaking up moisture from the skin. Wear super comfortable shoes because you will be walking a lot. On the last day of hajj when everyone goes to the farewell tawaaf, you will most likely not find taxis. Even if you manage to find one, the traffic is so unbearable that you might decide to walk it. I recommend Crocs style shoes/sandals as they are very comfortable and light. 6. As for men, especially those with thunder thighs, you may want to suggest preventative measures like using Vaseline to prevent thighs from abrasively rubbing together as this can cause discomfort. There might be over the counter medication for this but if you forget, don’t worry, because the doctors at Mina are all too familiar with this problem and will prescribe you a cream if it turns into a rash or the discomfort becomes a tad bit much. I pray Allaah accepts your hajj, and if you found these tips useful, please do share it with anyone you know who may be traveling with elders. Jazakumallah Khairan. A very important topic that needed to be discussed. There are even such elderly ones there who don’t have that much control on their bladder, so for few places (where traveling to the loo might almost be impossible at times) keeping adult diapering solutions with you can be a relief. JazakAllahu Khair for the tip! You reminded me of the time I had to buy adult diapers for a loved one several years back. That is very true sistr, jazakillah khair for that advice. It’s an option that should not be ruled out subhannallah.